BMW's gorgeous 5 series G30 model is an extremely popular car and we gets loads of enquiries for this car. To help our customers we have decided to build a page on our website listing the range of products and services that we offer for this model. For an expensive car, the audio system is very disappointing. The display and integration is excellent but the sound quality, and bass from the original speakers / underseat subwoofers is very poor. Even the factory upgraded sound system on some models leaves alot to be desired. The main problem with the newer BMW models is size and position of the speakers! The front and rear speakers are very small at only 100mm diameter and 40mm depth which is tiny compared to other german cars such as VW Golf ( 165mm front speaker ) and Audi A5 ( 200mm front speaker ). As the speaker position is so small we must put in really good speakers to compensate. We offer fantastic car audio upgrades for the BMW 5 series G30 from Audison. These excellent 4" Audison speakers are direct replacement for the original BMW front door speakers. These Audison speakers use BMW connections and bolt pattern which means no cutting or modification of the bmw original wiring harness. These speakers will significantly improve sound quality, definition and sound stage over the BMW original speakers but please remember that as they are the same physical size as the BMW speakers, they will not improve bass. These speakers are happy running of the BMW original headunit or can be amped in the future for extra output. Developed to take noise and vibration control to another level when installing your Car Audio products. Inherent problems due to road noise and car panel vibration which can be caused by the mechanical movement and the displacement of air by speakers has a negative effect on the SPL and sound quality of the car audio system. Skinz has a 3mm thickness and specially designed textured surface offers greater damping with increased sound wave diffusion than other products available, giving you the highest quality musical basis from any system. 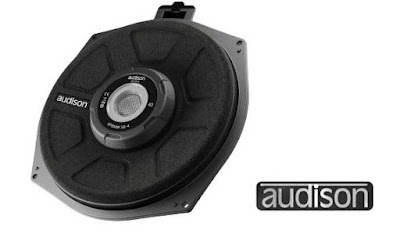 These excellent 4" Audison speakers are direct replacement for the original BMW rear speakers. These Audison speakers use BMW connections and bolt pattern which means no cutting or modification of the bmw original wiring harness. These speakers will significantly improve sound quality, definition and sound stage over the BMW original speakers but please remember that as they are the same physical size as the BMW speakers, they will not improve bass. These speakers are happy running of the BMW original headunit or can be amped in the future for extra output. These excellent 4" Audison speakers are direct replacement for the original BMW front door speakers but also include a seperate crossover network and tweeters. These Audison speakers + tweeters use BMW connections and bolt pattern which means no cutting or modification of the BMW original wiring harness. These Component speakers will vastly improve sound quality, definition and sound stage over the BMW original speakers especially with the addition of tweeters but please remember that as they are the same physical size as the BMW speakers, they will not improve bass. These speakers are happy running of the BMW original headunit or can be amped in the future for extra output. Including the genuine BMW Tweeter grilles in this price to give your car the complete factory original look. This brilliant 4 channel amp from Audison will be mounted discreetly in the boot and will run the new front Audison Components and the BMW original subwoofers under the front seats. These original BMW subwoofers are actually decent quality but they are woefully under-powered by the BMW factory headunit. When you add the Audison amp to these subwoofers, it really brings the system alive and provides decent bass as well as Crystal clear mids and highs from the Audison components. Audison Prima Subwoofers have been designed with electro-acoustic parameters that maximize performance for the factory box available below the seats. The ABS plastic basket, reinforced with fiberglass, and the acoustic structure featuring a front magnet, provide for a minimal installation depth for a perfect compatibility with the whole range. Two 5 mm polyurethane gaskets, supplied, allow the subwoofer to fit perfectly to the box, decoupling it from vibration. The AP8.9 bit amplifier was designed by Audison R&D Department to achieve maximum sound quality in OEM Integration applications. The powerful management software proves the ability to acquire the bit Drive presets which the Audison team fine-tuned specifically for your car. Thanks to the innovative power supply stage, a power of 520 W total can be achieved in an extremely compact case. The non-amplifiable ninth channel can be used to drive a subwoofer via the mono AP1 D amplifier. This fantastic powerful little amp will be used to run the whole system including Audison front speakers, Audison rear speakers and Audison Subwoofers. Also with all the additional wiring connectors that i am supplying the original BMW stereo will have really good control of the system amp. We did a very careful / Clean installation including using the latest Audison speakers which are exact replacement sizes and even have the BMW connections on them. The Audison subwoofers are also direct fit and again terminated with BMW connections so they simply plug in. But the most integrated part of the install was the range of Audison input and Output Harnesses we used to allow us to fit the Audison 8 channel amp without cutting or modifying again of the cars existing wiring. This is a huge PLUS for our customers as all wiring is left original and if required ( say upon car sale for example ) the full Audison system can be removed and the car's original speakers and subwoofers refitted and the car returned to its original condition without cutting wiring! The installation took us nearly 15 hours but was completed carefully and to a very high standard. None of the panel trims were marked or none of the fragile trims clips were damaged or broken. Clean neat installation takes time but the results are stunning. When the installation was finished we calibrated and set up the system using the latest Audison installer software. The system now has real power and presence and the mix of the upgraded speakers / subwoofers and the added power of the Audison amp really works! None of the Audison system is visual anywhere in the cabin and the only sign that anything has been upgraded is the hugely improved Acoustic performance and the 8 channel amp mounted high on the boot side panel. * Please note all our bodykit parts are sourced from a high quality German supplier and are higher quality than most sourced in China/Taiwan. * This rear diffuser is designed to fit the Msport rear bumper. * Cleanable - this product can be cleaned and used again several times hence saving you money longterm / does not affect warranty on vehicle.